Commercial hospitality fitouts are becoming more and more complex with cutting edge interior designs a requirement to provide patrons with unique dining experiences and allowing restaurants to differentiate from their competitors. AOM Australia is a leading supplier of commercial kitchen exhaust hoods in the Australian market. 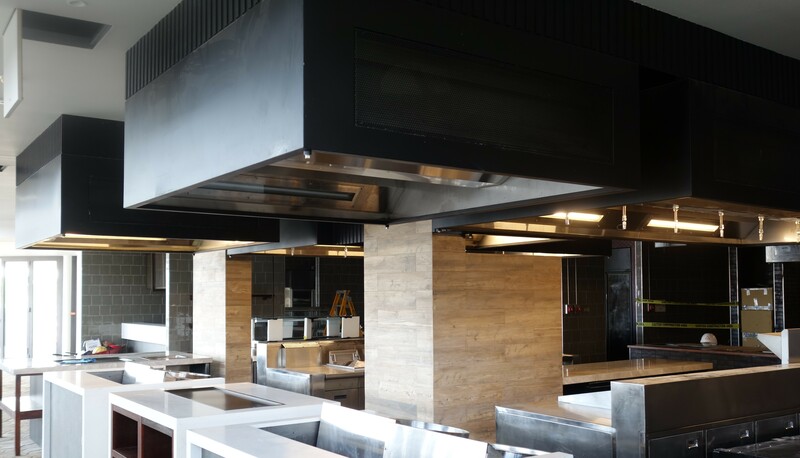 In addition to providing high quality performance kitchen exhaust hoods, AOM Australia now allows Clients to customise the exhaust hood finishes to match their interior design fitout. AOM performance hoods are manufactured in stainless steel 304 panels 1.2 mm thickness to a high quality finish which in themselves integrate well within certain fitouts. Recent examples of customised kitchen exhaust hoods include manufacturing in black stainless steel panels, black powder coating of stainless steel and the installation of rust coated stainless steel panels and tiled panels fastened to preinstalled cladding supports on the exhaust hood.